Honorary Chairman Chung Mong-joon of the Korea Football Association officially announced his bid for the presidency of the Federation of International Football Association (FIFA) in Paris Aug. 17. In his statement announcing his candidacy at Shangri-la Hotel in Paris, Chung, who served as a vice president of FIFA for 17 years before stepped down in 2011, vowed to fight widespread corruption within FIFA’s leadership, months after longtime FIFA President Sepp Blatter stepped down from his post amid the unprecedented arrests of nine organization executives on bribery charges. The statement contained eight pledges that Chung would carry out if he is elected. First is a promise to strengthen balance and restraint among various units in FIFA and set a term for the FIFA top official. He also pledged that he will serve just one-term if elected as FIFA president in a bid to show how clean FIFA has become. He said absolute power breeds corruption and the top man at FIFA thinks that he is the only one that can better serve the world football association. He also promised to make management of FIFA transparent during his term in office. He also promised to appoint women to important positions in FIFA, which did not happen under Blatter. He will also increase the cash awards for women’s football games associated with FIFA such as the women’s World Cup final. Chung also said someone from other than Europe should also be given the chance to head FIFA, which has long been dominated by Europeans. “No one can guess what world football would be like if big cities in Asia and Africa have football teams that can compete with football teams in Europe and Latin America,” Chung said, adding that he can develop football in Asian and African cities while running FIFA. The U.S. Justice Department on May 27 indicted nine current and former FIFA executives, as well as five marketing officials linked to the organization, on charges they accepted millions of dollars in bribes in exchange for preferential treatment for the disbursal of media and sponsorship rights. Blatter won re-election two days later, only to resign his post in June amid the corruption scandal. He vowed to spearhead FIFA’s attempts at self-reform before relinquishing his position to a successor by Feb. 26, 2016, after the organization’s next election. 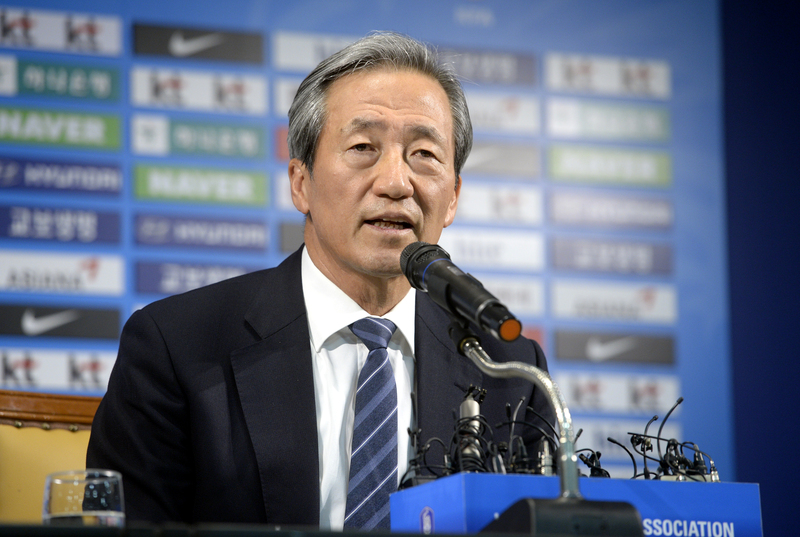 Chung, 63, was instrumental in bringing the World Cup to Seoul, South Korea, in 2002, CNN reported. He served on FIFA’s executive committee until 2011. A billionaire executive in the Hyundai Group, Chung also ran a failed campaign to become South Korea’s President in 2012. Within FIFA, he currently holds the title of honorary vice president. Chung will compete against Michael Platini, the current head of Union of European Football Association, who also announced his candidacy. FIFA vice president Prince ali bin al-Hussein, who Blatter defeated in last May’s elections, is also expected to enter the race.